The artistic display of dolls on nine steps represent the nine days of Navaratri. 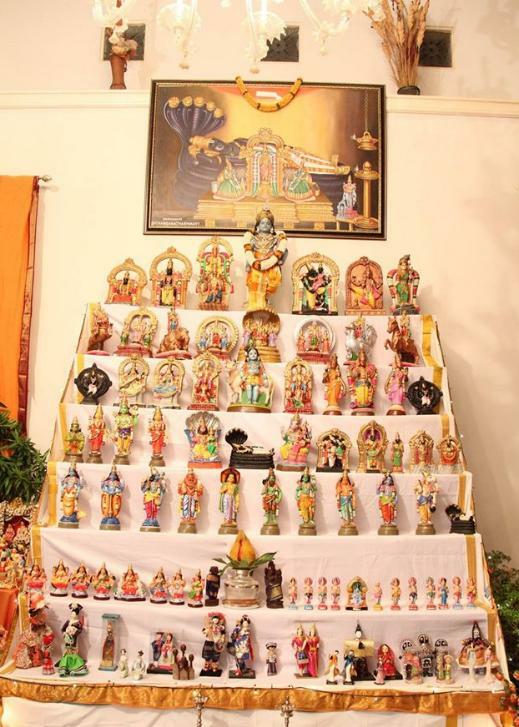 This exhibition is popularly known as Bombe Habba in Karnataka, Bommala Koluvu in Andhra Pradesh and Golu or Kolu in Tamil Nadu. Traditionally, a few top steps include idols of gods and a kalash (ceremonial jar) with fresh water, covered with a coconut and mango leaves. The next few steps have idols of saints and heroes of the country. Another step represents human activities, depicting functions such as marriage, temples, and an orchestra or music band. Business is usually represented by the Chettiar set of dolls, with shop items and wooden dolls called Marapachi dressed in colorful clothes. Today, Golu has the thematic representation of ancient stories, depicting scenes from Ramayana and Bhagavad Gita, among others. It is a custom to add a few new dolls every year. On the auspicious day of Amavasai (no moon), the Navaratri preparations start by setting up the steps, decorating the home and temple. The nine days of Navaratri start the next day and end on the tenth, which is called Vijayadasami (day of victory). Prayers, lamps, sundal, and sweets are offered to the goddess with Aarti on all nine days. The ninth day is celebrated with Devi Saraswathi (the goddess of knowledge and learning) pooja. On the ninth day, books and musical instruments are offered along with the Golu. Ayudai pooja (worship and thanksgiving to tools and implements and vehicles) is performed. All kinds of vehicles (such as busses, cars, and trucks) and tools (such as water pumps, chisels, hammers, ploughs) are thanked. The tenth day is the day of victory—an auspicious day to start new ventures and journeys, and a day to start learning new skills. On the tenth and last day, the Golu dolls are symbolically put to sleep and packed the next day to be brought out of the boxes the following year.